Break the chocolate into squares and place in a bowl. Microwave for a minute or two until melted, then set aside to cool a little. Meanwhile, beat the eggs with the light brown sugar in a large bowl. Add the melted chocolate, Fine Dark Cocoa Powder, ground almonds, Madagascan Vanilla Extract, and Dr. Oetker Bicarbonate of Soda, and mix well. In a separate bowl, thoroughly mash the avocado flesh, and add it to the chocolate mixture. Mix thoroughly. Lightly grease and line a deep metal baking tray (measuring approximately 8 x 8 inches) with baking paper. Transfer the brownie mix to the tray, and spread it out evenly. Bake for around 35 minutes, until a cocktail stick comes out clean. Leave to cool in the pan before cutting and serving. 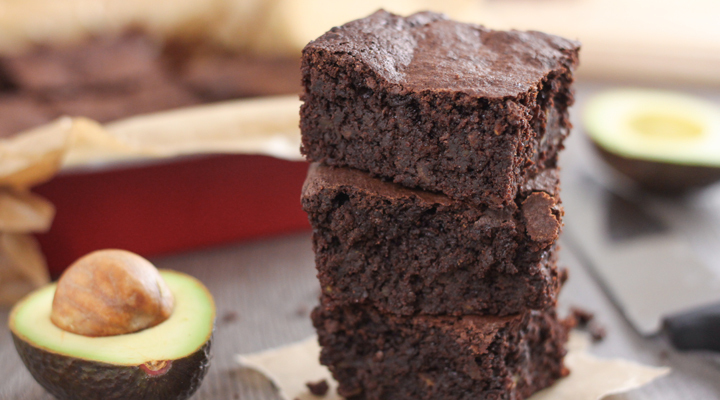 Use very ripe avocados to ensure they are soft enough to be mashed thoroughly - if your avocados are too under ripe, they will be tricky to mash, and you will end up with visible pieces of avocado in your brownies. This is perfect for someone like me on a low carb diet. Although I did substitute the sugar with splenda and chocolate milk with an unsweetened version but Thanks so much for posting.